Wonderstruck GIVEAWAY of EPIC Proportions! $100 Amazon Gift Card! We are extremely excited to announce an epic giveaway made possible by a certain author who donated his prize for his winning Novella submission to promote this anthology! A huge thank you to Jon Messenger (Author of: Wind Warrior) for donating this gift card to you amazing fans and readers! Prepare to be Wonderstruck! Join us in celebrating the launch of Clean Teen Publishing’s first Young Adult Anthology: Wonderstruck. Wonderstruck is a YA anthology with works of inspiration based on five images. Authors around the world were invited to submit their interpretation of these five images and compete in a writing competition. 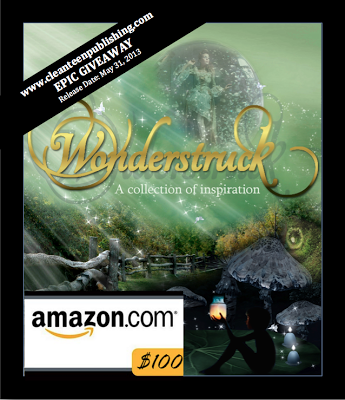 The categories for the Wonderstruck anthology include: a Drabble (A story told in 100 words. Not 99, not 101, but exactly 100 words,) a Short Story, a Novelette and a Novella. Enter the Rafflecopter below for an opportunity to win a $100 Amazon gift card, a digital copy of Wonderstruck and a Wonderstruck bookmark.